The Steelers signed former Colts 2017 fourth round draft choice Zach Banner on Sunday. Banner is a massive human-being at 6’8 345 pounds, but hasn’t been able to put it together at the NFL level. He was released by the Colts prior to the start of the 2017 regular season. After being released by th Colts, Banner was signed onto the Browns practice squad. He spent the entire season in Cleveland before being released in March. He was then signed by Carolina before being released two months later on May 31. 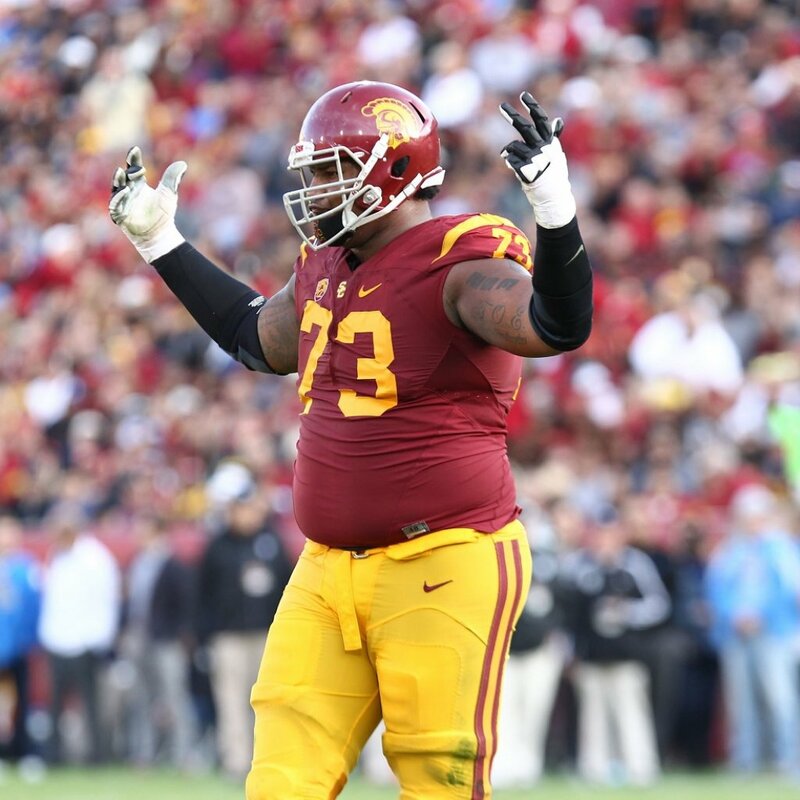 Banner played the majority of his snaps at right tackle in college at USC. Struggles as a run blocker have plagued his career so far at the NFL level. Here is his scouting report heading into the 2017 NFL Draft from Bleacher Report. The biggest player in the 2017 draft class is Zach Banner. At 6’8 ½” and 353 pounds (with 34 ⅞-inch arms and 10 ¾-inch hands), Banner has a massive frame. At that size, he plays with great power and can push, pull and drive defenders out of his path with ease. As a three-year starter at tackle, Banner has experience on both the left and right sides. In pass protection he uses his length very well and has a strong, tight punch. In the run game, watch out. Banner’s forward momentum and burst are exceptional, and he’ll put defenders on the ground. As a finisher, he’s exceptional. Banner is a good overall athlete, especially when you consider his size. He could work as a right tackle in the NFL or move inside to guard. Being able to control his weight is a huge (no pun intended) issue. Banner was up to 385 pounds at one time and is still very heavy at 353. He can be heavy-footed and stiff-legged in space and struggles too often to keep his leverage down. If asked to play on the edge as a tackle, Banner doesn’t have the quickness to mirror or kick-step to protect the corner. He has to play inside where movement, especially lateral movement, will be limited. Banner has a bad habit of playing with his chest over his toes and must learn to play with better balance—which is terrible for a guard but a fixable issue. Two hip surgeries in his freshman season must be checked. Improving his bend and keeping his weight down will go a long way toward making Banner an NFL starter. I’m glad to hear that Leveon Bell will be playing this season with the Steelers. I hope they reach an agreement by next season. He belongs with the Steelers.